Easy, cheesy recipes make many an appearance across these pages, from Raspberry Cream Cheese Pinwheel Pastries and Cheesy Chicken Pizza Pockets to Homemade Parmesan Hamburger Buns and Cheesy Leftover Mashed Potato Pancakes. It’s safe to say I’ve got all my fellow cheese lovers covered. But that’s why I find it hard to believe that despite there being more than 500 recipes on this site, not a single one is for plain ol’ mac and cheese. Sure, the Roasted Garlic Macaroni and Cheese is a fan favorite. But what about a quick, easy stovetop-only version of the most classic of all comfort foods? 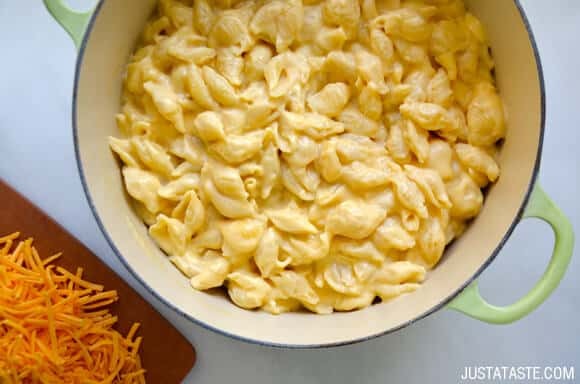 Now, the wait is finally over with this 30-minute homemade macaroni and cheese recipe starring sharp cheddar and Parmesan cheeses, plus just a pinch of my secret ingredient. There’s no baking and no breadcrumbs. Just pure and simple the best, easiest, cheesiest macaroni and cheese to ever cross your lips. 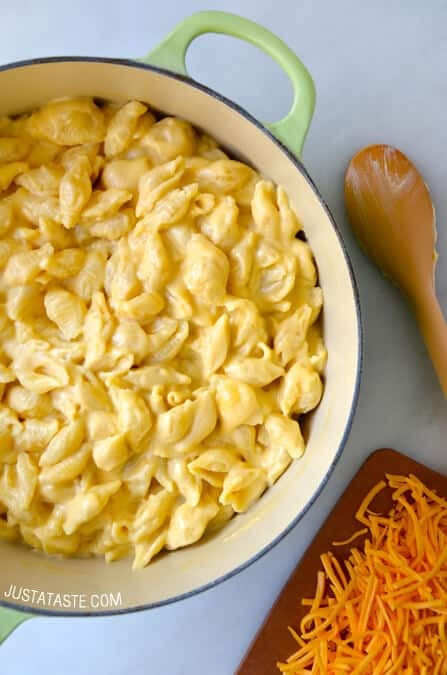 And for all those looking for an added kick to this comfort food favorite, don’t miss my crowd-friendly Roast Garlic Macaroni and Cheese that bakes up golden brown and bubbly in your oven! Bring a large pot of salted water to a boil. Add the pasta and cook it just until al dente, about 11 minutes. Drain the pasta then set it aside. 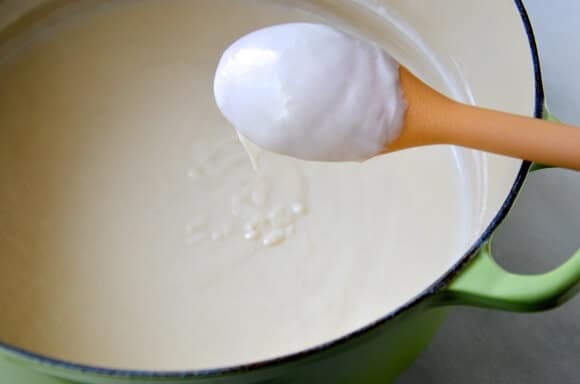 In a medium saucepan set over medium heat, warm the milk until it is simmering then set it aside. In a large heavy-bottomed stock pot, melt the butter over medium heat. Once the butter has melted, whisk in the flour and cook the mixture, whisking constantly, until it turns light brown in color and has a slightly toasted aroma, about 3 minutes. Whisk in the dry mustard (optional). Return the pot to the stove over medium-high heat and cook the mixture while whisking constantly until it has thickened enough to coat the back of a spoon, about 2 minutes. Season the mixture with salt and pepper and reduce the heat to medium. 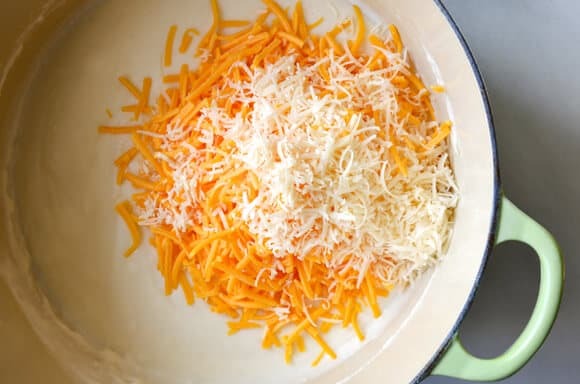 Stir in the cheddar and Parmesan cheeses until they are melted and the cheese sauce is smooth. Add the pasta, stirring to combine, and cook just until the pasta is warmed throughout. Serve immediately. 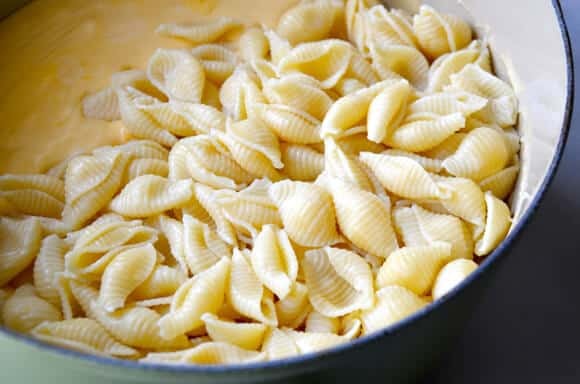 I prefer shell-shaped pasta for macaroni and cheese, but you can use whatever shape you prefer. Elbow macaroni, orecchiette and cavatappi noodles also work well. After stirring in the pasta, feel free to fold in any additional ingredients, including diced ham, chicken and lobster or blanched veggies, such as broccoli or squash.